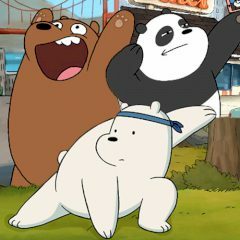 Do you wanna to have so much fun and play with Grizzly, Panda and Ice Bear. Each of them has his own funny tasks. Just be quick enough and try to win each challenge! Are you ready? Then go ahead and try to be attentive enough. You will love the game. You will play with Grizzly, Panda and Ice Bear or one of them online, trying to get more followers in the social web. Just do it as quick as possible, have fun using your skills in mini-games such as swiping delicious food towards their mouth right after taking a photo of them, or do quite the opposite and work out in the gym, where people will have to get used to see a bear using fighting martial arts to practice his body and have fun! Speed will be an important factor in this Cartoon Network game. Enjoy it!